The New Hyundai Verna Fluidic is a perfect blend of exquisite interior and sporty exterior. The car adorns style, luxury and sporty appearance. 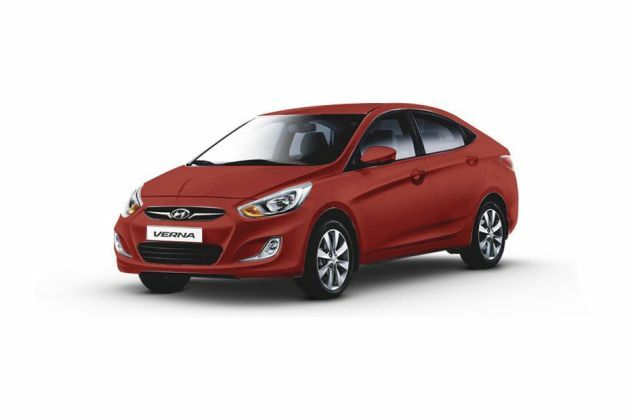 With Verna, Hyundai left no stone unturned in delivering the perfect machine for the Indian market.Hyundai – the South Korean car maker company, launched Hyundai Verna first in 2006 and once again it has created the old charisma with new looks, added with the latest features. By checking the appearance and attributes of new Hyundai Verna, it is quite certain that the car is going to deliver tough competition to the other cars in the C+ segment and deliver same positive effect to the company. The company is offering Verna with eight engine variants i.e. 1.4L Petrol/1.4L Diesel, 1.6L Petrol/1.6L Diesel, two SX 1.6L petrol/diesel version and two high-end variants with optional features. The 1.6L petrol/diesel engine models are available in two transmission options – automatic transmission and manual transmission , whereas the 1.4L petrol/diesel models have only the manual transmission option.The New Hyundai Verna Fluidic provides the right mix of exquisite, comfortable & classy interiors with a sporty exterior. Moving forward, the exterior looks of the car boasts sporty looks accompanied by improved & two tone headlamps, front hexagonal grille, L-shaped fog lamps and sleek & trendy bonnet. Adding more thrust to the eye-catchy appearance of Hyundai Verna Fluidic, the car is fitted with trendy side mirrors integrated with turn lights, chrome plated door handles and big tail lamps blended with a massive stop light. Furthermore, Hyundai Verna’s standard model has horizontally shaped turn indicators and reverse lights for a sportier look.As we know, interiors have always been a plus point for this South Korean car company. Living up to its reputation, Hyundai Verna has kept up with the previous benchmarks. The interior of New Hyundai Verna Fluidic is packed with comfort, luxury and safety measures which include a V-shaped console with integrated music system, six airbags for front seat driver and passenger, ABS, front & rear seat belts and adjustable steering wheel. For complete entertainment and relaxation while driving, the top model of new Hyundai Verna encompasses an MP3 CD-system with a complete set of speakers and tweeters, power steering, power windows and automatic climate control system. The new Hyundai Verna Fluidic has refreshingly big headlamps, a hexagonal grille, L-shaped fog-lamps, giving it a sports car look. Hyundai Verna Fluidic 1.6 CRDi EX AT has a curvy but sleek shape along the length of the car giving a streamline cut appearance to the sides and comes with stylish side-mirrors with integrated turn lights, chrome coloured door handles and alloy wheels. For a distinct appearance, the new Hyundai Verna boasts huge wrap around tail-lamps on its bumper. Also for delivering a touch of sportiness, Hyundai Verna is added with twin exhaust exits at the rear.To give an ideal drive with maximum mileage, new Hyundai Verna is fitted with an ECO mode indicator which assists in acquiring maximum fuel efficiency if driven at the ideal RPM and speed and the car is capable of reaching the speed of 0-60 kmph in an impressive 4.87 seconds. The New Hyundai Verna Fluidic is a good balance of technology and elegance. The car has a dual tone dashboard, with a steering wheel similar to the i20. The audio and bluetooth control buttons on the steering wheel offer a great deal of ease effect. Fitted in the “V” shaped central console, the car is added with an integrated MP3/FM player , single zone climate control and unique in-built air purifier. The music system is accompanied with 2 remotes and incorporates a speed dependent auto volume and the multimedia system also includes 4 speakers plus 2 tweeters for delivering perfect audio quality . With ample leg room at both, the front and rear along with generous head room, the interiors are quite roomy and spacious. Another unique feature on the new Verna is the inclusion of the rear camera that displays in colour on the centre rear view mirror when in reverse gear. Faux wood inserts are seen all around the cabin. The cabin of the new Verna has all the storage bins spread around for cans, sunglasses and other stuff. Hyundai Verna Fluidic 1.6 CRDi engine model is accessible in manual and automatic transmissions. This variant is equipped with a 1582cc engine with 4-cylinders for distributing 126bhp at 4000rpm . The maximum torque circulated by this 1.6-litre diesel engine is 260Nm at 2750 rpm. The 1.6-litre diesel engine of Hyundai Verna delivers 22.32 kmpl.For an ideal drive with maximum mileage, new Hyundai Verna is fitted with an ECO mode indicator which assists in acquiring maximum fuel mileage if driven under an ideal RPM and speed and the car is capable of reaching the speed of 0-100 kmph in impressive 10.20 seconds . For delivering a comfortable driving experience on a long journey, Hyundai Verna Fluidic 1.6 CRDi EX AT comes with perforated leather upholstery and additional comfort is delivered by height adjustment feature of the driver seat which also offers sufficient under thigh and back support. Hyundai Verna Fluidic holds some additional interesting features such as the cooling glove box. The rear seats are known for providing comfort to all the occupants and again the car offers good back support with adequate thigh rest and ample space for 3 people. Since the car is a 5- seater, the rear seat incorporates three adjustable headrests . In terms of safety and handling, the New Hyundai Verna Fluidic 1.6 CRDi EX AT definitely holds a wide range of new and advanced features such as standard six airbags (optional, fog lamps and disk brakes/drum brakes depending on variant), new generation head and chest airbags with passenger side airbag for complete safety of all the occupants. Safety features of new Hyundai Verna Fuidic CRDi also include front and rear seat belts built with quality material.As far as handling is concerned, the all New Hyundai Verna Fluidic offers an easy to park and maneuver facility with a light steering and tyres with good grip. Adding to the safety of passengers, Hyundai Verna comes fitted with keyless entry, reverse parking sensors, reverse camera, auto folding electric mirrors and ABS.